To start, there are 2,975 reasons from 90 countries. 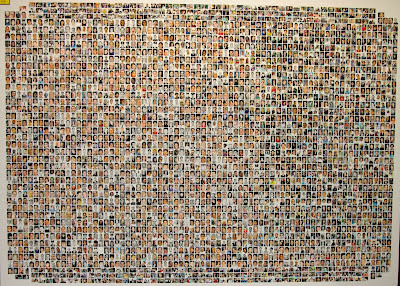 An unforgettable patchwork quilt of humanity that was disappeared on a Tuesday morning ten years ago. 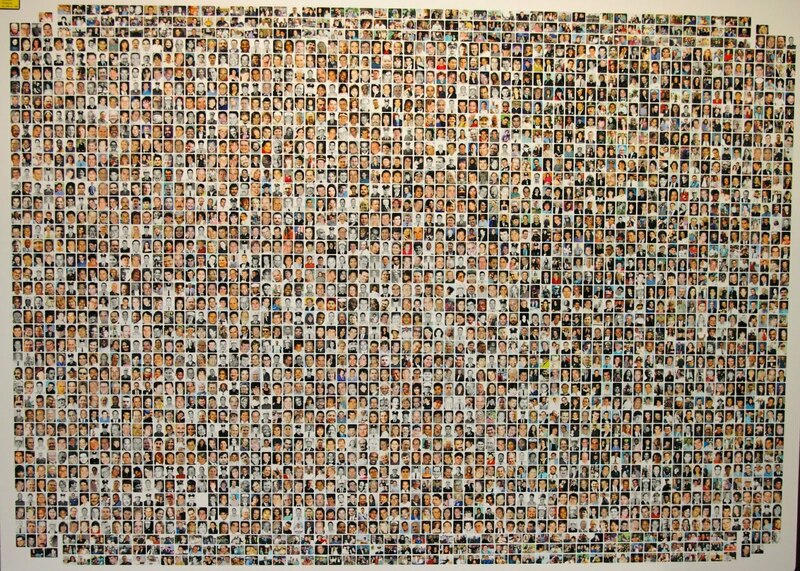 (credit for photo above depicting many victims of 9/11) But that is only the beginning. I hate Al Qaeda for all the human beings they have killed – the Africans, Americans, Arabs, Asians, Europeans, agnostics, atheists, Christians, Jews, Hindus, Muslims. I hate Al Qaeda because they have murdered thousands of Muslims even while claiming to represent them, a claim they make even while bombing mosques during Ramadan. Because they reduce a rich religious heritage to a series of absurd prohibitions. They make the most sacred pronouncements, like Allahu Akbar – God is Great – into threats, into epithets. I hate Al Qaeda because of the Caliphate of Doom they want to build. I hate Al Qaeda because in these ten years they have facilitated the brutality of some on the right who built “enhanced interrogation” chambers for celebrations of simulated drowning. Because now almost everyone accepts a little torture. But I also hate Al Qaeda because they have inspired some on the left to say the stupidest things. Proclaiming that Osama bin Laden was in the end simply an “unarmed victim” about whom there was no evidence of wrongdoing. That Anwar al-Awlaki is just a “Muslim cleric.” The people in the towers on 9/11 were “little Eichmanns” who deserved their fates. Inane. I hate Al Qaeda because they hate women, gays, Jews, Christians, Muslims not like them, which is most Muslims. Because they only hate. And they make me hate too. I hate Al Qaeda because they wanted a clash of civilizations. And we gave it to them in Qur’an burnings, in marches against Mosques, in Iraq. I hate Al Qaeda because they support every one of the worst Muslim movements – Al Shabab (“the youth”), the Taliban (“the students”), Boko Haram (“Western education is a sin”) – the same movements we must defeat for the real youth, the actual students, to get a decent education, to have a future. Because we have to waste time talking about them when we should be talking about building that future for generations coming of age in an economic and environmental meltdown. I hate Al Qaeda because the way forward should be the Democratic Spring, because jihadism should be the past. I hate Al Qaeda for the young Algerian fiancé who bled to death in his mother’s arms in Cherchell after a suicide bomber broke his fast this August; for Mustapha Akkad and his daughter Rima; for Danny Pearl, Amenia Rasool, and Father Mychal Judge, all of whom are no more because Al Qaeda is. I hate Al Qaeda for the bombs of Baghdad, of Algiers, of Amman, of Dar es Salaam, of all the cities they have blighted like New York. 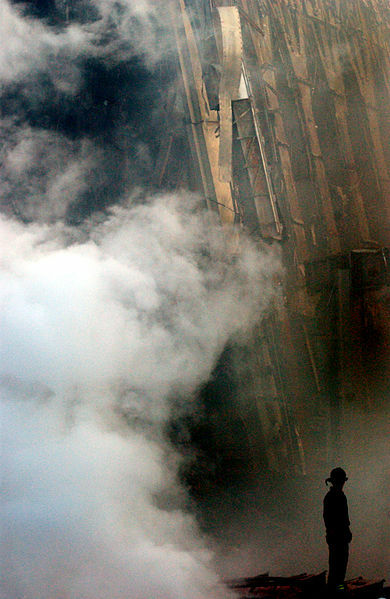 (credit for photo at left of firefighter standing amid smoldering ruins at World Trade Center days after the 9/11 attacks) Because a myriad of conspiracy theorists absolve them of their crimes even when they say they have committed them. I hate Al Qaeda because there is no excuse for what they do, yet people make excuses for them. I hate Al Qaeda because not enough of us will openly say we hate them, but those who do, no matter the risk, are made invisible. Because a Muslim bomber always makes headlines while a peace activist of Muslim heritage warrants virtually none. I hate Al Qaeda because they make it harder for people who look like my father to board an airplane. Because they confirmed every racist’s view of Muslims. And provoked responses from the Bush Administration that confirmed every anti-American cliché. And I hate Al Qaeda because on one breathtaking September day they changed the world in an explosion of cruelty. Ten years on, I am ready to stop hating Al Qaeda. I am ready to stop Al Qaeda. I can understand the sentiments and it is indeed a painful experience to tolerate a terrorist organization like this on our earth. They have tried to make our lovely and peaceful world into the worst nightmare they could ever make. What an eloquent, well-reasoned article. Thanks for verbalizing what many of us feel but don't quite know how to say. Wow! Thanks for the pitch-perfect post! This is one of the sanest and most just texts against terrorism that I have read. I congratulate the author with all my heart and wish that many more like him would publish their own comments, so that our media and our governments would stop kowtowing to islamist terrorists under pretext that they represent the muslim majority, when they only represent themselves, - a vicious mindless minority of hatred and violence.